Getting your day started on a high note! When the recycle bin is full of paper, this is a fun greeting to try. Give each child a piece of recycled paper and have them write their name on it. Then have them crumple the paper into a ball (i.e.- “snowball”) and put the kids into 2 groups on opposite sides of the carpet. When it’s over, have each child pick up a piece of paper and greet the child whose name is written on it and within a set time find out one thing they have in common. 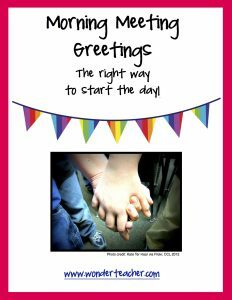 Susan Antonelli has this and several other great starters for the day in this downloadable PDF. Timata te ra pai, ka ki i te kata.